Since it first opened in 2006, the 21C Museum Hotel Louisville has twice been named the Top Hotel in the U.S. by the readers of Conde Nast Traveler magazine. That is because it is more than a place to eat and sleep – it is a bona fide cultural institution. The 21C broadens public access to contemporary art with its rotating collection of paintings, sculptures, photos and video installations. 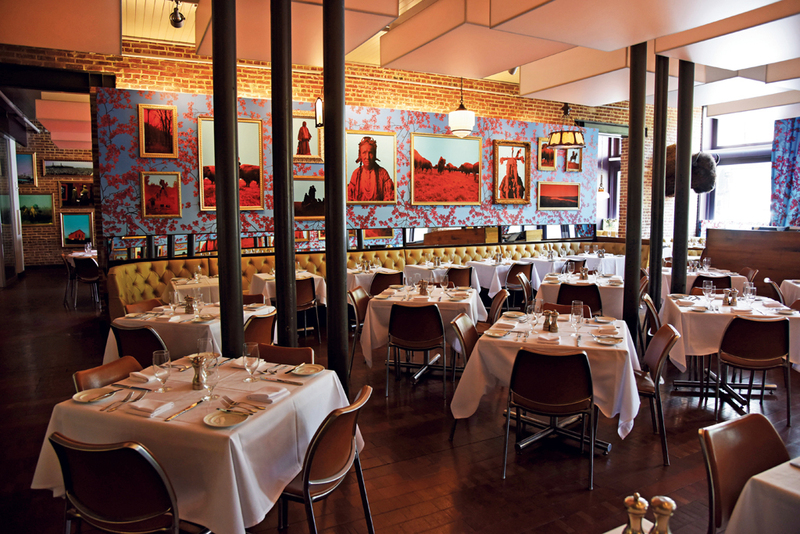 That same creative spirit extends to Proof on Main, the hotel’s celebrated restaurant. This is especially apparent in the way the bartenders and cooks at Proof on Main use Kentucky’s most popular export: Bourbon. In 1964, Congress declared Bourbon America’s only native spirit. Kentucky is responsible for 95 percent of the world’s supply thanks to a natural mix of climate, conditions and pure limestone water necessary for the liquor’s production. That makes Bourbon a major draw for any tourist visiting the Bluegrass State and thus a must-have for all the establishments that cater to them. 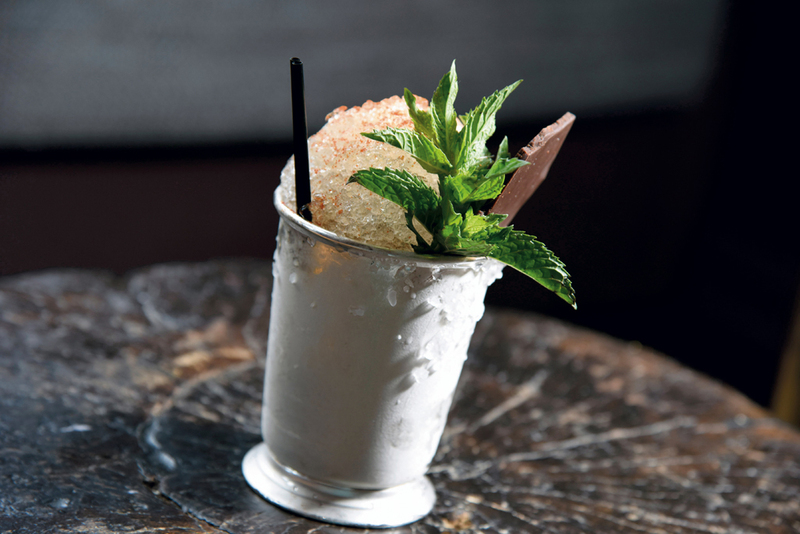 The bartenders at Proof on Main have created several award-winning Bourbon cocktails, but it is the restaurant’s cooks who make Bourbon a special attraction for hotel guests by finding unique ways to use the liquor’s flavor in their dishes. Bourbon is so popular right now that Wajda wants to use it as a highlight without imitating what anyone else is doing. He paired Bourbon barrel fermented sauerkraut with a bison heart pastrami from Woodland Farm, which is owned by 21C founders Laura Lee Brown and Steve Wilson. Wajda took the dish down to the Atlanta Food & Wine Festival earlier this year and it was a big hit. On the day of our interview, he was taking some fire-roasted jalapeño peppers and pickling them in a Bourbon barrel. 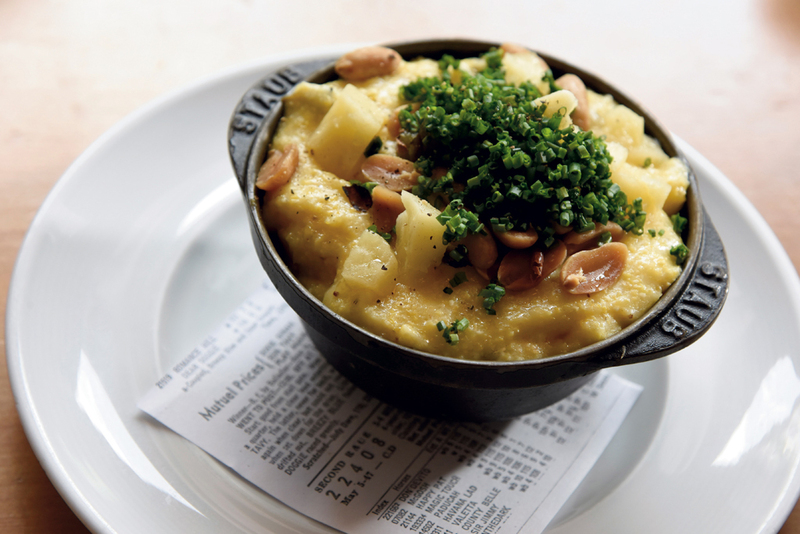 The jalapeño peppers are one of the ingredients, along with pickled peanuts, in Proof on Main’s Louismill Cheddar grits. One reason that Wajda is able to think outside the box when it comes to Bourbon is his background. The 31-year-old chef was raised on a farm in northeast Ohio. He graduated from the Pennsylvania Culinary Institute in 2007, worked for three years as chef de partie at Restaurant Gordon Ramsay at The London Hotel in New York City and then worked at multiple restaurants up and down the East Coast, including Craigie on Main in Cambridge, Massachusetts. In 2014, Wajda joined Michael Mina Group in San Francisco as corporate sous chef, and helped to manage 23 restaurants and over 1,500 employees. 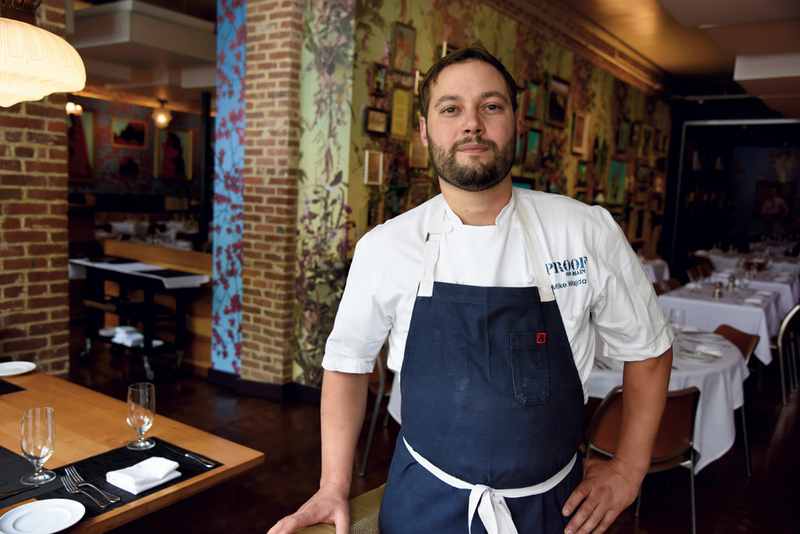 Despite his unfamiliarity with Southern cuisine, Wajda has been able to maintain Proof on Main’s reputation as a Southern food mecca. This is because he uses native Kentucky vegetables grown at Woodland Farm or purchased from other local farmers. The ubiquity of Bourbon on the menu also helps. Every category on the menu has at least one dish that incorporates the liquor. 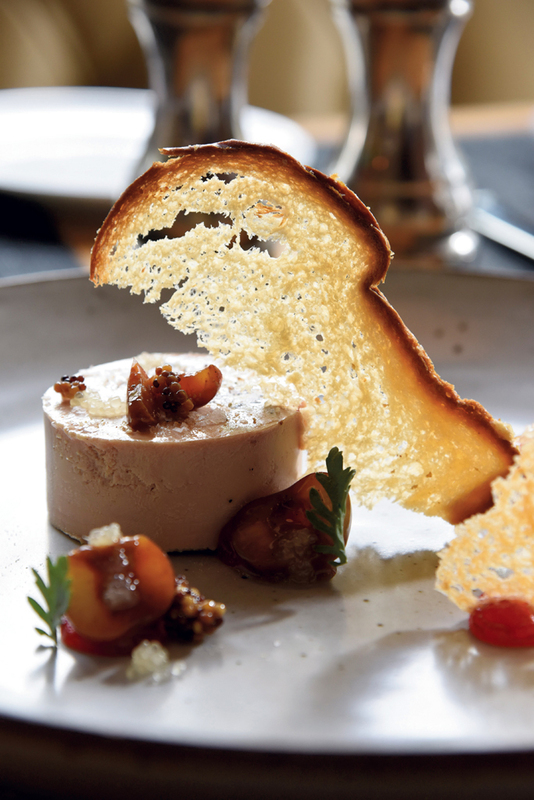 The tasting platters include a chicken liver mousse, which replaces the sherry usually used in the recipe with Bourbon. Three appetizers have Bourbon as an ingredient. The fish in the smoked Kentucky catfish dip is smoked with Bourbon barrel wood chips and served with a house hot sauce and sea salt crackers. The blackberry pop tart is an adult version of the childhood favorite. It starts out with locally grown blackberries cooked down to a puree with other flavors. The filling is put into a toasted crust with a crispy chicken skin and the chicken liver mousse layered on top to make it look like it came from Kellogg. The Bourbon barrel pickles are seasoned for six weeks in a Bourbon barrel using Asian and other global flavors, such as dried seaweed. 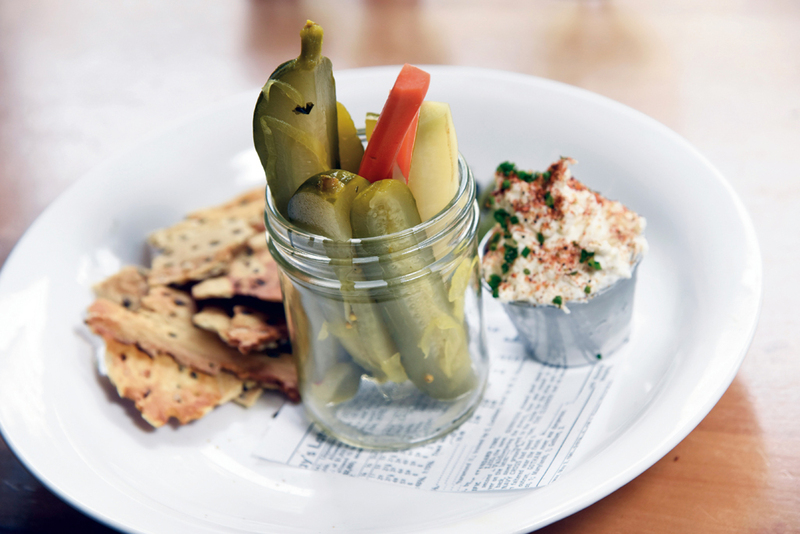 The pickles are served in a Mason jar with ginger pickled carrots and a smoked onion dip. 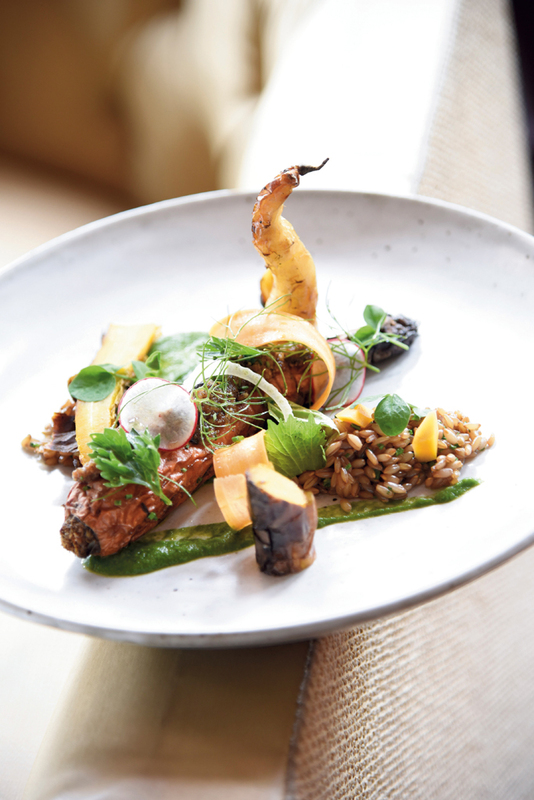 Another one of Proof on Main’s popular entrees is a vegan dish – the ash-roasted carrot. A whole heirloom carrot is roasted under embers and Bourbon barrel ash to give it a nuance of flavor. The dish is served with green garlic, walnut pesto and a spring vegetable salad. Even the dessert menu includes the dark chocolate torte which uses a Bourbon gastrique to go along with the graham cracker and toasted marshmallow gelato. Gastrique, a caramelized sugar, deglazed with vinegar is a not an uncommon flavoring sauce, but Wajda said the use of Bourbon elevates Proof on Main’s version of it from what guests would encounter in other local restaurants. One of the luxuries of being at the 21C is that Wajda has a wide variety of Bourbons with which to experiment. In 2015, the bar in Proof on Main was named one of the 20 Best Hotel Bars in America by the digital magazine Thrillist based on the number of Bourbons it stocks – up to 120, depending on availability. Chea Beckley, the 21C beverage director, said premium and ultra-premium Bourbons sell best at the hotel. That means that top brands like Pappy Van Winkle, Buffalo Trace Antique and Michter’s 20 Year are not always on hand. Most of the cocktails on the Proof bar menu were designed by the restaurant’s own bartenders. Damien Cooke won first place in the 2016 Four Roses Rose Julep Competition for his drink “Hot to Trot,” which is made with Four Roses Yellow Label. In 2015, another Cooke creation, “Up All Night,” won first place at the Bourbon Raw Drink Competition hosted by Elijah Craig. 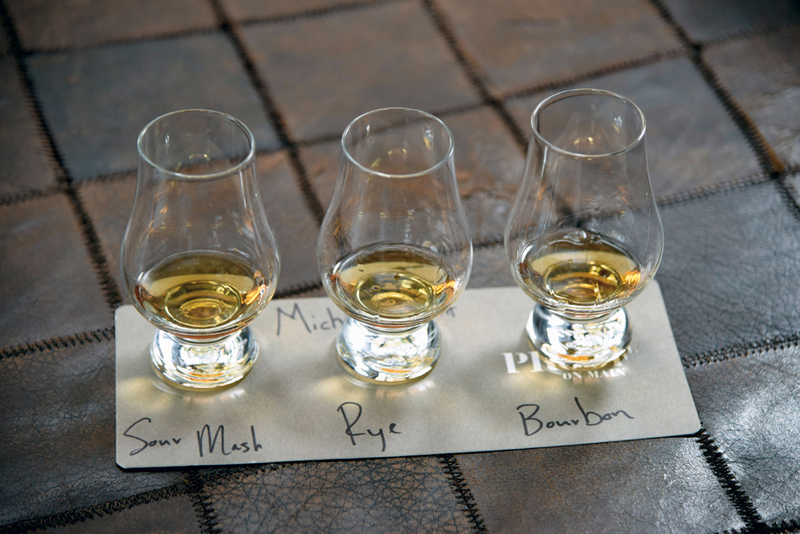 It is important to Cooke that guests taste in his drinks the aging barrel’s woody notes and the other flavor combinations that come from Bourbon’s mash bill or specific combination of grains – corn, wheat, rye and so on. In 2008, the Louisville Convention and Visitors Bureau created the Urban Bourbon Trail, a culinary and cocktail experience to capitalize on burgeoning interest in America’s native spirit. Since then, the number of stops has increased from seven to 35. 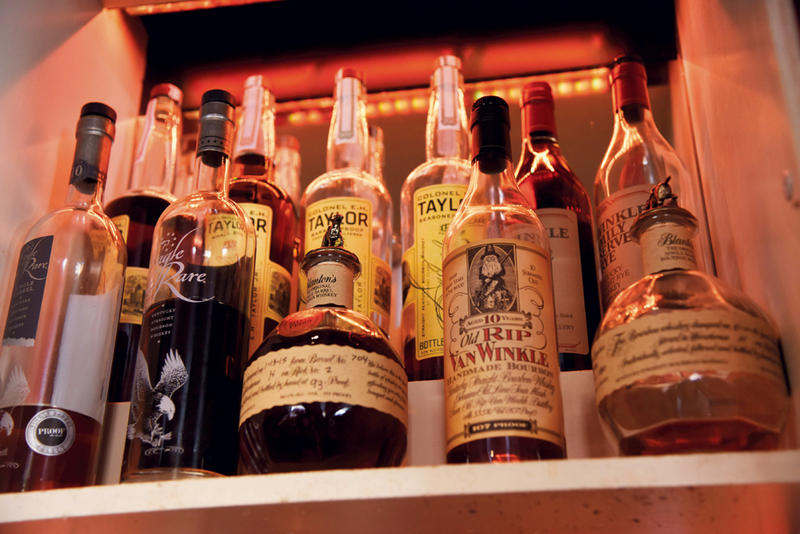 Participating establishments must offer a minimum of 50 Bourbons and use Bourbon as an ingredient in some menu items. 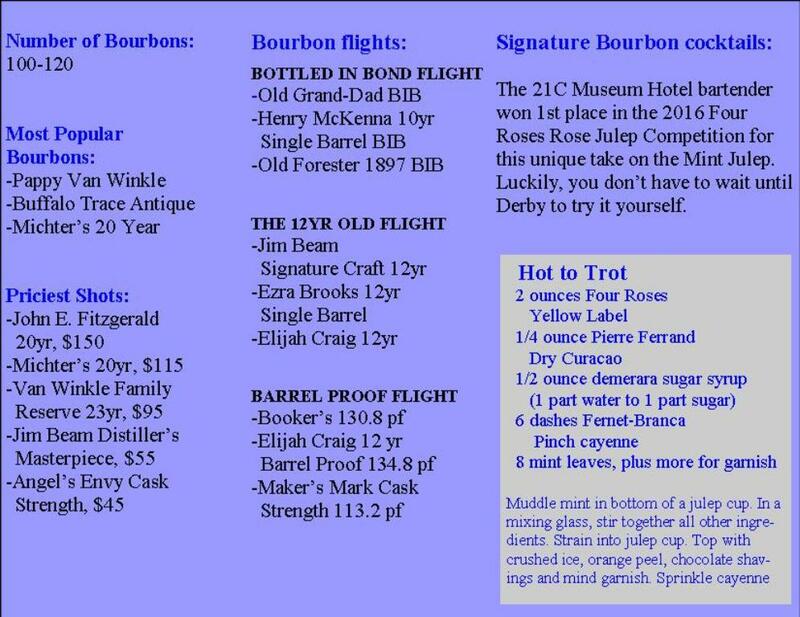 For more information and the complete list visit www.bourboncountry.com/urbanbourbontrail.